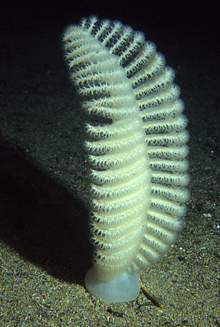 Sea pens reach a height of about 20 centimetres and can be found around Fiordland. Photo: Malcolm Francis. When we think of life in the ocean we often think of our whales, our dolphins, fish and crayfish – things we can see and things that can see us. 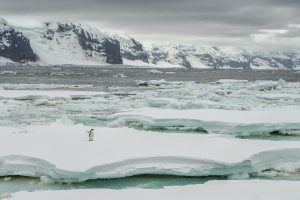 But actually the building blocks of life in our sea – that provide us with the oxygen we breathe, absorbs the carbon dioxide we pump into the air and regulates the weather and ocean cycling – is actually invisible to the human eye. They are microscopic. They are our plankton, diatoms and foraminifera. Our what? Exactly. 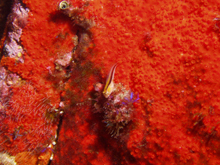 Seldom do we celebrate the very morsels that the rest of our marine wildlife could not do without. Well here’s our chance. 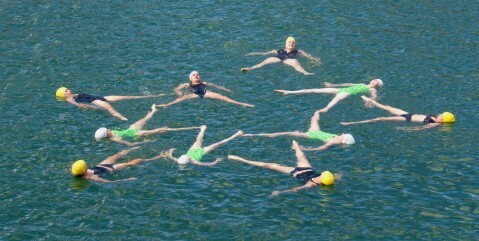 Yesterday marked the first day of Seaweek 2009 and to kick things off, Forest & Bird and the Wellington Synchonised Swimming Club took to the water to become synchronised swimming starfish and jellyfish. Although well known, these creatures don’t often get the praise they deserve. Now take jellyfish as an example. Jellyfish are generally only thought of in a negative light, but they actually play a very important role in our ecosystems. Most often comprising a whole community of animals rather than one singe entity, jellyfish provide shelter for a number of juvenile oceanic species and they are also eaten by a variety of sea life such as turtles. Seaweek is an opportunity for all of us to celebrate and enjoy all of our marine places and species. There’s beach cleans galore – even underwater ones – and so much more. 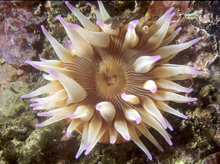 Visit Forest & Bird’s web site or the national Seaweek web site (www.seaweek.org.nz) for more information. And remember, it’s the little things that count. To find out about some of the small things you can do to make a BIG difference – click here. And if you’re not brave enough to leap into our waters, we’ve provided a photographic showcase below of some the super-small creatures that fill our oceans. 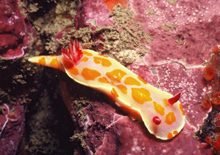 A clown nudibranch, or sea slug, 6 mm. Photo: Kirstie Knowles. Don’t forget to join us (and 95 sea lions) lunchtime at parliament on Wednesday to support calls for reduction in sea lion deaths in fisheries! Whooohooo I saw the sea lions at Parliament in the paper.They were so cute! Good work F and B team!!!!! Interesting that a Government Minister can reduce the lives of 95 sea lions down to something signed off on a piece of paper and not equate it to battered bodies of female sea lions drowning in trawl nets and their youngsters waiting in vain for their mother’s return – and similarly dying the long death of starvation.